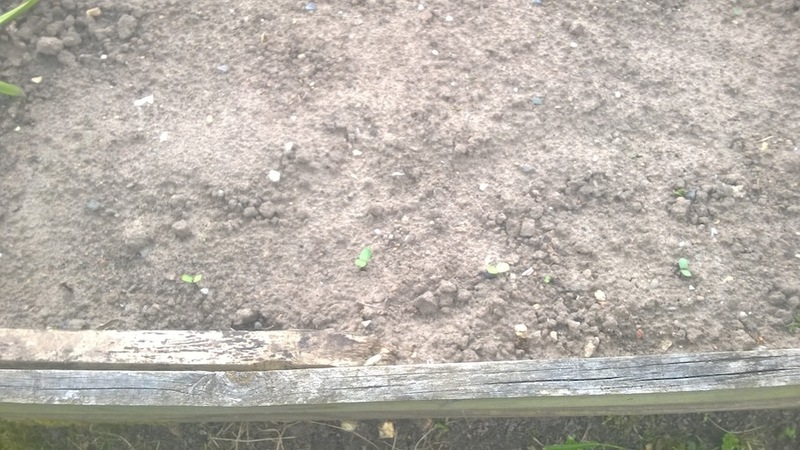 This week, K and I have tidied up the messy area next to the shed and planted some more sweet peas that we’ve been growing in the little plastic greenhouse at home. We’re really pleased with the result, and think the rest of the area could be given over to a path next to the raised bed and some pots, maybe. Perhaps even some tumbling tomatoes in pots, which might look good. 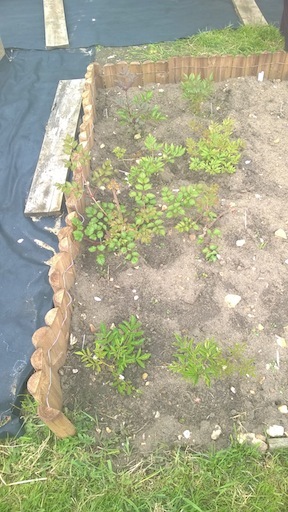 The good thing is that I could use some of the stones from this area to lay on one of our strips of lining to form a path, or rather more of a path. 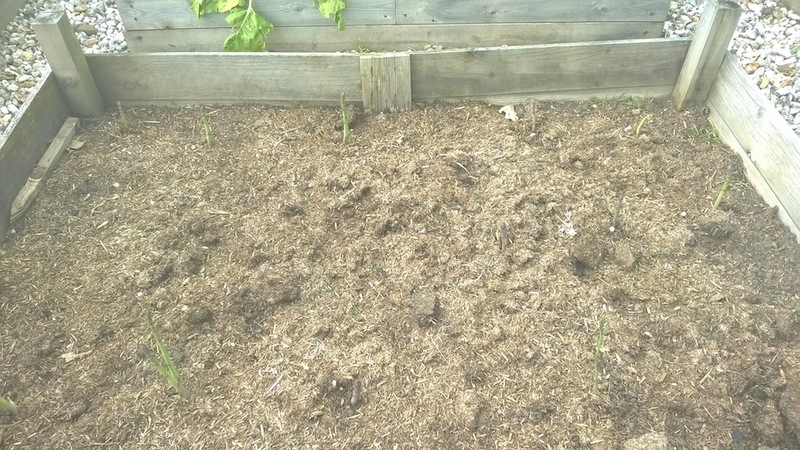 Over in the asparagus bed, things are growing well and we’ve harvested more asparagus today, which has been totally delicious. 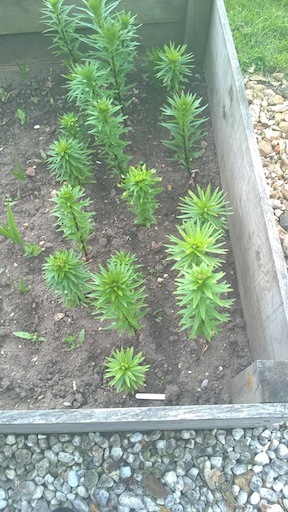 However, we know that there are two new plants in the bed and we’re not supposed to harvest those in the first year – the trouble is we can’t remember which they are so we’re relying on a bit of guesswork and a lot of prayer. 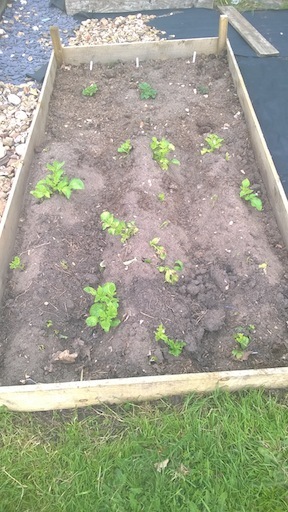 There’s good news about our potatoes as well – post our frost moment, the new earthing-up seems to have done the trick and they’re happily growing back, hurrah. 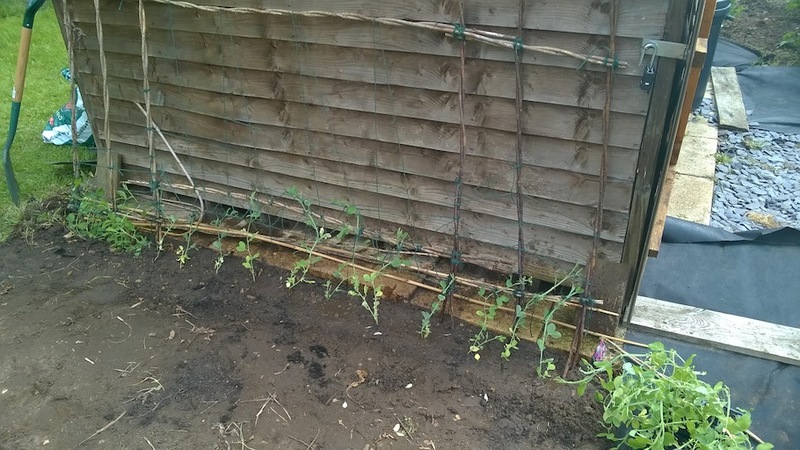 While K was digging out the bed for the new sweet peas, I spent some time hand-weeding the soft fruit area, and between the paths too, just to keep things vaguely under control. 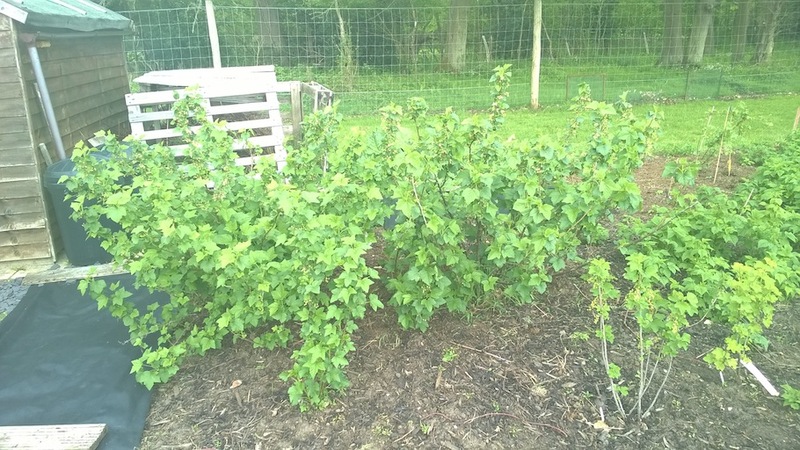 The soft fruit is looking pretty good, so that’s exciting. 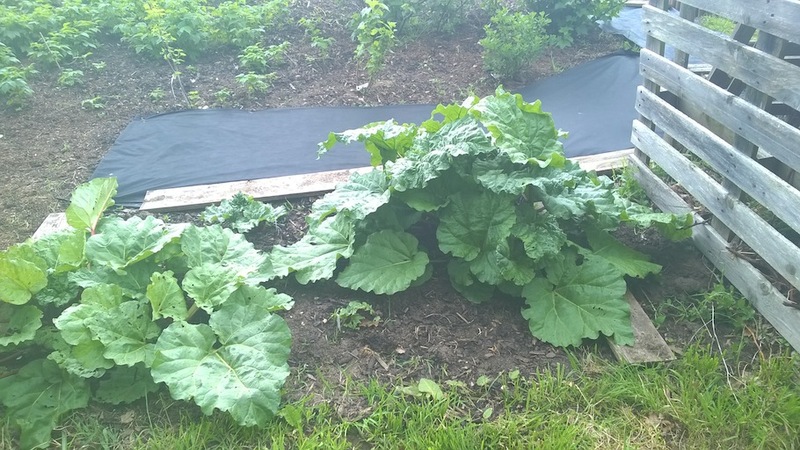 Meanwhile, the rhubarb is truly the gift that just keeps on giving, though it is getting rather chewed up by slugs (or something), no matter how much Slug Doom I scatter over them. 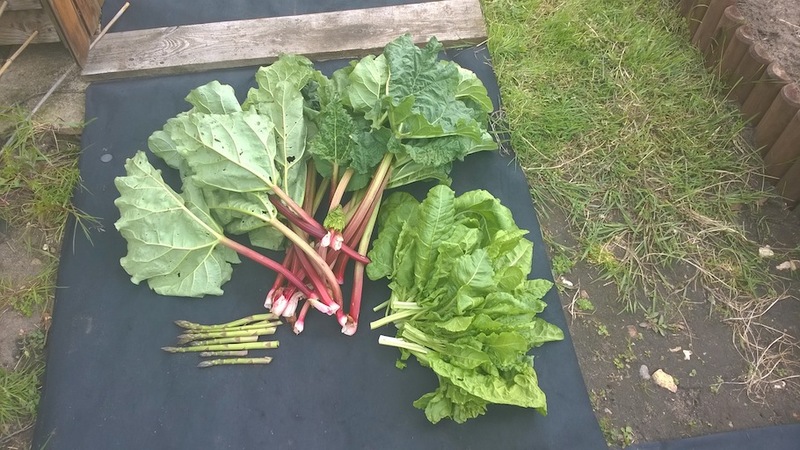 However, this week’s crop has done us proud as presents for a friend and a lovely rhubarb and ginger crumble with cream for lunch today, bliss. Plus K made a lovely spinach soup with cream and leeks (shop-bought, oh the horror …) which was totally amazing – definitely must do that again! 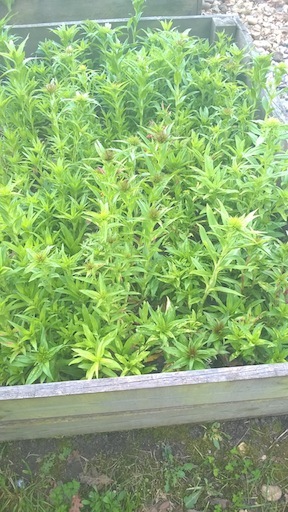 And in the cut flower beds, the astilbe is coming along, the sweet williams are thinking about being in bloom and – best of all – the sunflower seeds (Russian Giant) are starting to sprout, so it really feels as if summer is just around the corner. 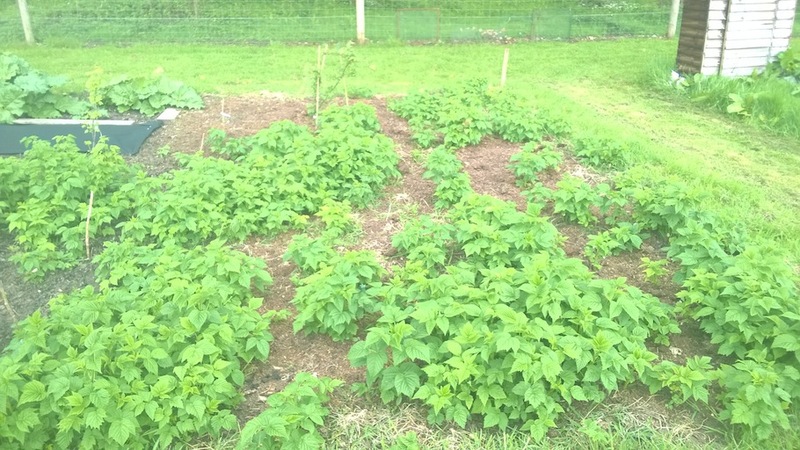 Categories: Allotments | Tags: asparagus, astilbe, lilies, path laying, potatoes, rhubarb, soft fruit, spinach, sunflowers, sweet peas, sweet williams, tomatoes | Permalink.